Have you ever needed to move an entire Outlook contact list to an iPhone without using iTunes to sync the device to a computer, and without deleting the contacts already stored on the iPhone? No problem, here’s a simple two stage process on how to migrate all contacts from a Windows PC with just about any version of Outlook. This guide will also work with an iPad or iPod touch. 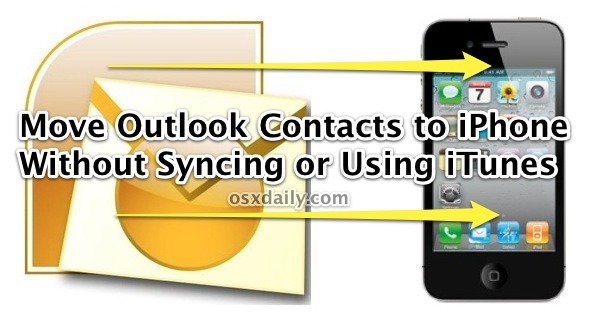 The last commands are essential because it joins all of the Outlook contacts together into a single vCard file that can then be easily imported into iOS and the iPhone. Verify the import worked by returning to the iPhone home screen and tapping on the Phone icon and then “Contacts”, where the Outlook contacts should now appear within the iOS Address Book alongside any other contacts that previously existed. This is a great tip for people who are switching from Windows, changing jobs or computers, or if you just want to pull a long existing contacts list to an iOS device without having to sync and associate the device to that computer. Thanks to EK for the tip! Wish I had known about this months ago, I used the sync from Outlook method and it torched my existing contacts. So annoying. Importing and adding is always better. Thanks for the post, will use in the future! Start Menu > Run is not always available : I recommend using the keystroke Windows(Flag key)+R. Then please don’t write command.com this may not even work : type “cmd” without the quotes of course. That’s for syncing however, not for copying over. Is there a way to do the same thing with the notes from outlook? Some might face an issue with selecting all contacts and seding them due to Size or Max Attached Object restrictions (specially if using corporate email). The solution would be to do them in batches, by highlighting the contacts in phases, Right clicking, and selecting Send Full Contact -> In Internet Format (VCard). It will create an email and attach the contacts in .vcf format. You can then just select all the attachments and copy paste them into a folder without having to send the email. Is there something folder-access-wise I need to modify? it will work. This saves the file in the same directory that houses the .vcf files. Hope this helps. Hi Shawn, I have tried your suggestion and it’s still not working. I am having the same issue. I have tried both of the final commands “copy /a *.vcf c:\allcards.vcf” and Shawns code of “copy /a *.vcf c:\temp\allcards.vcf” and it isn’t working for me either! Makesure you when you highlight all of the contacts in OUtlook, that you use the Action drop down menu to select “Forward as Vcard” or whatever it isays… don’t just select all the contacts and right click and select “Forward” b/c it sent them as MSG files. At least this was the case for me (Outlook 2003, Windows XP). When I used the Actions drop down menu and selected “Forward as VCard” it worked great. Hi. Had same problem, it listed first contact then said access denied. tried the copy/a *.vcf c:\temp\allcards.vcf code and it worked fine. You sometimes need to open up CMD as Administrator, it gives you that option if you right click on CMD. WHen I do this, my iPhone 4s recieves it as winmail.dat rather than the vcard. My regular mail recieves it normally. The iphone won’t do anything with the file. maybe an iOS5 thing? This worked beautifully. Absolutely no hiccups. Thanks a million !!!!! i have stored this mail, in my mailbox. whatever happens in future, i can simply resend the mail to iphone and repeat the last step. I’m indebted!! This worked on my Vista using Shawn’s command line except that all the contacts have pages of html code in the notes field and they’re all duplicated. Going to try syncing with Google now which I’d rather not do but I have to have my contacts. This all started with my updating the iPhone to IOS6. Did you ever get a resolution to the text showing up in the notes section. Same is happening to me. this saved my life! thank you thank you thank you! This worked really well! Super way of getting all your contacts accross. Only thing is that it failed to produce the email when forwarding as vcard with over 1000 contacts. (like mentioned already before in this tread) I tried many free apps and batchfiles and what not. This is by far the best and simplest way of getting your contacts accross. I had this issue, the simple thing to do is run cmd prompt as administrator. Start Menu > Type CMD in the find bar, when i shows up on the program list RIGHT CLICK ON CMD, then choose run as admin. This will get rid of the access denied issue. –broke it down into sections, contacts a-g, h-p, r-z and re-attempted, issue continued – options were to import 32 on the a-g, 18 with the h-p and 97 on r-z. Very helpful article . A technophobe like managed to copy all the contacts from my BTyahoo mail to my new IPAD really easily and quickly. Sadly Apple support couldn’t offer any advice on how to do this ! Thanks for the info……very useful!!! I have exactly the same problem as dan chase. Does anyone have a solution for this? Found the solution; the problem is due to sending the email from Outlook using rich text format; change it to plain text format, so other email programs can read the attachment. Loved these easy instructions, it worked seamlessly. I am not the most comfortable person typing instructions but just follow the directions. Read the comments, they are also instructive. Steps are working, but require manual interaction each time. I hate iTunes and iCloud related stuff, they are too clunky. Why not sync them via Google, automatically? if you want keep contacts copy in iPhone, uncheck again contact sync option with iclouds and select the option keep the contact on iPhone…. the simple thing to do is run cmd prompt as administrator. « Are These Pictures of the Next iPhone?